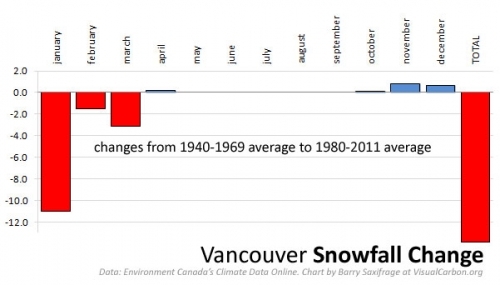 Last week I showed how global warming was changing Vancouver’s January weather. Today, I show the major climate trends across all our months. Annual rainfall in Vancouver has increased by about half a foot since baby boomers were in diapers, as the chart above shows. All seasons except summer are significantly soggier. November shows the biggest jump in added rain. The least rainy year on record was 1942. The first year to break the 1,400mm barrier for total rainfall was 1980. The first year to break the 1,500mm barrier was 1997. If the trend continues a super soggy 1,600mm year is heading our way in not too many more years. What role does El Nino/La Nina play? The El Nino/La Nina phenomenon can create weather havoc over much of the globe when either phase kicks in. But in Vancouver, according to my analysis, El Nino years average only 2% more rain and La Nina years average only 1% more rain. And neither 1980 or 1997 which broke new rainfall records were an El Nino/La Nina year. One of the “fingerprints” of the greenhouse effect is nights warming more than days. If there were no greenhouse gases, like on the moon, the nights would cool very quickly as all the radiant heat escaped into space. Despite moon days topping 110 C, moon nights quickly cool to below -160 C. The more greenhouse gases, the warmer the nights get relative to days and the smaller the range of temperature between day and night. This phenomenon has been recorded worldwide for decades as fossil fuel burning has increased our greenhouse gas blanket. 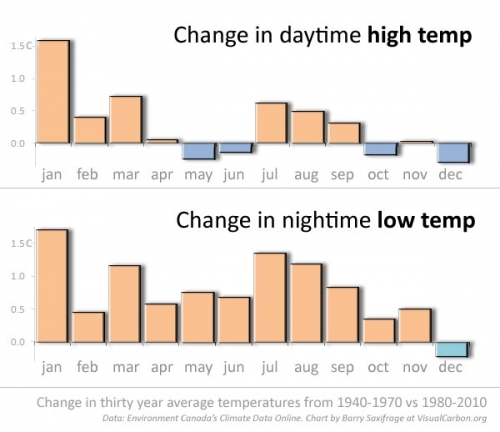 Just as predicted by climate science, our Vancouver nights are indeed warming more than our days. Every month except December has warmed at night. And even in December, the nights have cooled less than the days have. The difference between day and night temperatures has decreased in every month here…even cooling December. While only December has colder nights, four months -- May, June, October and December – have colder daytimes. Toss in the fact that April and November are basically unchanged during the daytimes and you have half the year without daytime warming. Few people outside a lot in the winter. And fewer still are regularly outside during the coldest part of the night at any time of year. As a result, most of our local warming occurs when we are inside and don’t notice. The average annual amount of snowfall has declined dramatically, especially in January, February and March. Lots more “in the pipeline”. It’s going to get a lot worse before it stops getting worse. There is a 25 to 35 year delay between when we spill CO2 into the atmosphere and when the full impact of the extra energy it traps is felt. So we are only now experiencing the full effect from the fossil fuel pollution humans spilled decades ago. We have decades more of humanity’s largest CO2 dumps that still have lots more energy to add to our weather. We know it will get worse for decades even after we stop emitting fossil fuel pollution. The only question is how bad we let it get. Extreme weather years like 2010 and 2011 are very likely to increase in frequency, since there is a delay of several decades between when we put heat-trapping gases into the atmosphere and when the climate fully responds. This is because Earth's oceans take so long to heat up when extra heat is added to the atmosphere (think about how long it takes it takes for a lake to heat up during summer.) 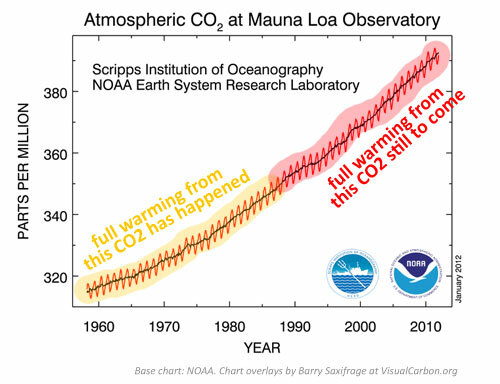 Due to this lag, we are just now experiencing the full effect of CO2 emitted in the late 1980s; since CO2 has been increasing by 1 - 3% per year since then, there is a lot more climate change "in the pipeline" we cannot avoid. We've set in motion a dangerous boulder of climate change that is rolling downhill, and it is too late to avoid major damage when it hits full-force several decades from now. However, we can reduce the ultimate severity of the damage with strong and rapid action. A boulder rolling downhill can be deflected in its path more readily early in its course, before it gains too much momentum in its downward rush. For example, the International Energy Agency estimates that every dollar we invest in alternative energy before 2020 will save $4.30 later. There are many talented and dedicated people working very hard to deflect the downhill-rolling boulder of climate change--but they need a lot more help very soon. Endnotes: All the data used in my charts and referenced in this articleome from Environment Canada’s Climate Data Online records for “Vancouver Int’l A” weather station. This is the default station for Vancouver as it is the only one that meets the United Nation's World Meteorological Organization standards. I have used this data to provide my own climate trend analysis for our city because I’ve been unable to find this kind of information elsewhere. However, I am neither a meteorologist nor a climatologist so more qualified experts may interpret the data differently. If you know of another climate analysis for our area please leave me a link in the comments section. Thanks.